When you leave a comment on THIS post by 6 p.m. CT Sunday, November 18, 2012 you'll be entered in the DRAWING for a copy of the book below. If you mention in your comment that you’re a follower (see in the left column “Join This Site” and “Follow by Email”), I’ll add your name a second time in the drawing. You can read details about my book giveaways here. Some commenters are still not leaving their EMAIL ADDRESS. I can't enter you in the drawing unless you leave your email address with your comment. Also be certain you are on the page where the blog appears when you leave a comment. Some comments are appearing on other pages of my website. Who knows what lurks out there is cyberspace? Our guest today is Deborah Malone. Deborah’s first novel Death in Dahlonega, finaled in the American Christian Fiction Writer’s Category Five writing contest! Deborah was also nominated for 2012 Georgia Author of the Year in First Novel category. She has worked as a freelance writer and photographer for the historical magazine, “Georgia Backroads.” Deborah has had many articles and photographs published and her writing is featured in “Tales of the Rails,” edited by Olin Jackson. She is a member of the Georgia Writer’s Association. 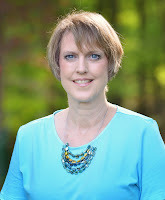 As a current member of the American Christian Fiction Writer, Deborah has established a blog where she reviews Christian Fiction. Trixie Montgomery’s back on the beat, facing her own spectral fears covering ghost sightings at the Marietta History Museum. With sidekick and best friend, Dee Dee, in tow, the women brave a sleepover inside the haunted museum to discover what lurks behind closed doors. When their worst fears occur and a dead body is discovered right under their noses, Trixie’s reputation both as a journalist and crime solver, are once again put to the test. First introduced in the acclaimed Death in Dahlonega, Deborah Malone presents another delightful Trixie Montgomery Cozy Mystery. 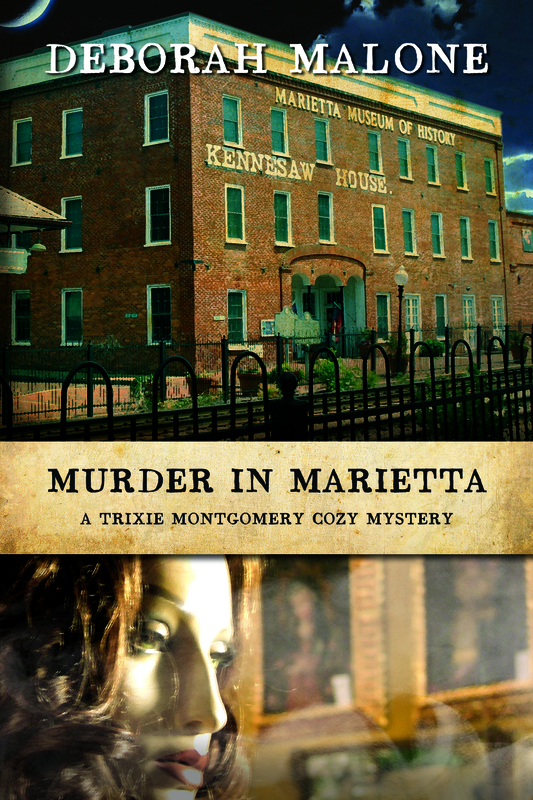 Join Trixie and Dee Dee while they explore the charming streets, and tantalizing restaurants, along with the colorful—and sometimes spooky—characters, and find out who materializes as the culprit in Murder in Marietta. Can you give us a sneak peek at your new release, “Murder in Marietta”? Trixie and Dee Dee head off to Marietta, Georgia for another assignment. They visit the Marietta History Museum where they spend the night to see if they can sight the resident ghosts. Sometime during the night a murder takes place in the museum and the director, Doc Pennington, is put on the suspect list. He asks Trixie and Dee Dee to help him find the real killer. Nana takes a larger role in this book and she won’t disappoint you with her antics. All of this together makes a recipe for murder and mayhem. I’ve always loved to read so I think it was natural that I’d transition into writing. Mysteries have been my genre of choice since I was a young girl and loved to read Nancy Drew. Cozy mysteries are one of my favorites and Ann George has been a big influence on my writing. As for writing Christian Fiction – Margaret Daley’s books were a big influence. How did you know you were called to write? I’ve always wanted to write, but while I was writing my manuscript I wrote it as a secular book. While I was writing it I was thinking I’d like to write it in a manner that wouldn’t be offensive to Christians. I didn’t even know there was such a thing as “Christian fiction.” I had finished the manuscript when I read one of Margaret Daley’s books and went to her website where I discovered Christian fiction. I couldn’t get enough. I joined ACFW and began to study how other writers wrote their books. I went back and rewrote my manuscript as Christian fiction. Are you a panster or do you outline? I’m definitely a panster. I have a general outline on how I want the manuscript to progress, but that’s it. Then I might do a general outline for each chapter, but none of it is done in detail. Now after I’ve written a chapter I will go in Microsoft One Note and detail the chapter so I can keep up with my characters, timeline, setting, etc. I started writing seriously in 2001 when I began writing for “Georgia Backroads,” a historical magazine. I am still writing for them. I started on my book in 2002, but life got in the way and so I came back to it around 2009/10. Tell us something silly about you. My friends and family could probably answer this better than me. The one thing I can think about is that I love to sing – but I can’t carry a tune in a bucket. So I sing in the car with the windows rolled up and the radio/CD’s going to cover up my singing. I’m working on the third book in the Trixie Montgomery series. Trixie and Dee Dee along with Nana and Trixie’s mama Betty Jo have gone to Savannah/Tybee Island, Georgia for a vacation. Of course they are going to have to help someone find a killer. What has been your most challenging experience writing a book? I don’t think I can list just oneJ Learning the craft/rules of writing was a big curve for me. Then there is the editing. Then there is submitting to publishers. And then when you are finally published you think you are home free – not! Then there is the marketing. It seems there are always new challenges to learn in writing and publishing a book. What is a fond childhood memory? I have many fond memories, but one that stands out is when my grandmother bought me a horse. My parents weren’t able to afford one so she chipped in to help and one Christmas they surprised me. Boy was I surprised. I just finished “Honored Redeemed” by Loree Lough. Deborah, thanks for an interesting interview and information about Murder in Marietta. I appreciate the copy of Murder in Marietta you've given, which one of my commenters will win in a drawing. Remember: leave a comment on THIS post by 6 p.m. CT Sunday, November 18, 2012 and you'll be entered in the drawing for a copy of Murder in Marietta by Deborah Malone. You must be eighteen, have a U.S. mailing address, void where prohibited. Please, please remember to leave your email address so that should you be the winner I can get in touch with you for your mailing address. I’ll announce the winner in Monday’s blog. Jennifer, thanks for stopping by and reading my blog. I appreciate your support as a follower. Thanks for commenting. Hope you get to read both books! I would love to win these books. I have read no books by this author. If I win, it also gets a review. Debbie, thanks for coming by and leaving a comment. I appreciate your being a follower and supporting my blog. squiresj, if you like mysteries you'll like Deborah's books, especially her Trixie character. Thanks for reading my blog and for leaving a comment. Dana, I appreciate your being a follower and supporting my blog. Thanks for coming by and leaving your comment. Thanks for taking the time to stop by and leave a comment. Good luck on winning and if you don't win I hope you'll get a copy to read. That was a wonderful intereview, I loved Nancy Drew too. I bought your first book and hope to read it soon. I thrilled that you have another book out! I would really love to read both. Carol, you're welcome. Thanks for being a follower and leaving a comment. I appreciate your support of this blog. hello Jo and Deborah. Sounds like you stay busy Deborah with all of the places you write and your books. This one sounds like it will keep you on the edge as we try to help you find the killer. I would like to win it as I haven't read one of your books yet. Thanks Jo for the chance to win it in doing this interview. And, I am a follower of your blog and by email. Hi Maxie, thanks for being a follower of this blog. I appreciate your coming by and leaving a comment. Thanks for stopping by. I enjoy writing about the different areas in our state. I'm familiar with them also through magazine articles I've written so I already had some of my research. I read Deborah's first book. It was interesting and quick to read. I'd like to read this second book to see what Dee Dee and Trixie get into next. Thanks for the chance to win a copy of Murder in Marietta. Pam, I like Dee Dee and Trixie and can't wait to see what they will get themselves into next. Thanks for reading the blog and leaving a comment. Thanks for reading "Death in Dahlonega" and I'm glad your looking forward to reading "Murder in Marietta." Thank you for stopping by and leaving a comment. This book sounds so good. I read "Death in Dahlongea" and loved it so can't wait to read this book as well. I'm a follower too! Jo, thank you. I appreciate your being a follower of the blog. Thanks for coming by and leaving a comment. I love Christian historical cozy mysteries. I would love to win this one. I am a subscriber and follower. Deanna, thanks for reading my blog and leaving a comment. I appreciate your being a follower and supporting my blog. These are contemparary fiction, but there are historical facts in my books. Thank you so much for stopping by and leaving a comment. Good luck on winning a copy. karenk you're welcome. I'm glad you're a follower and support my blog. Thanks for leaving a comment. So good to see you here. Thank you for stopping by and leaving a comment. I know you are a supporter of my blog. Loved the interview. Murder in Marietta sounds like a very good book. Thanks for being a follower. I appreciate your supporting my blog. Thanks for coming by and leaving a comment. Thank you so much for stopping by and leaving a comment. Good to see you here. If you don't win I hope you'll purchase a copy. You're entered. Thanks for coming by and leaving a comment. Looks like we have the same name. Glad you took the time to stop by today and leave a comment. Jo and Deborah, I enjoyed the interview. It so much fun to learn a bit about the author and book background. I think "Murder in Marietta" would be a fun read. Glad you enjoyed the interview Thanks for stopping by and leaving a comment today. Kay, I'm glad you came by and left your comment. I appreciate your being a follower and reading my blog. Sounds like an interesting read. I'm also a follower. teshaw(at)sbcglobal(dot)net. Thanks for stopping by and leaving a comment. Good luck with the drawing. Tammie, I appreciate your support by being a follower. Thanks for coming by to read my blog and for leaving a comment. Thank you for the book, "Murder in Marietta". I look forward to reading it!